You came to the right place to write a perfect receptionist resume. One that will land you that dream job with this amazing company you always wanted to work for. That will present you not as just one of 500 other candidates but one in 500. A receptionist resume example better than 9 out of 10 other resumes. How to write a receptionist resume in our builder and land more interviews. Tips and examples of how to put skills and achievements on a receptionist resume. How to describe your experience on a resume for receptionist positions to get any job you want. 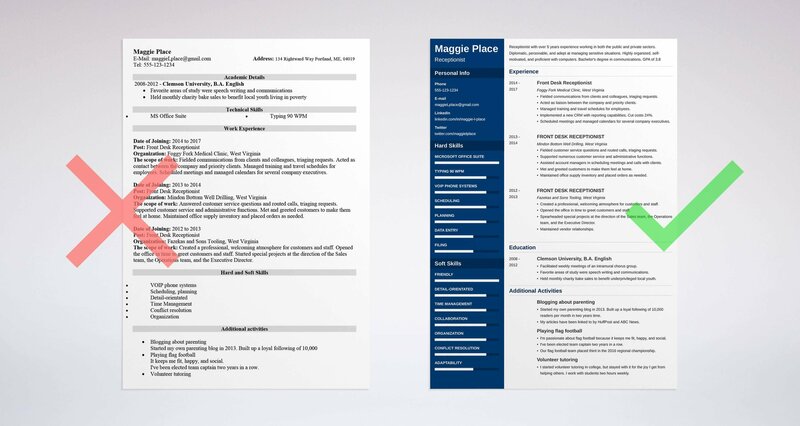 Here's a sample resume for a receptionist made using our resume builder. Receptionist Resume Example - See more templates and create your resume here. The hiring manager, we’ll call him James, has a pile of 500 receptionist resumes on his desk staring him in the face. He won’t read them. He’ll merely skim them for important details. If he doesn’t like what he sees at a first glance—the resume goes to the bin. Make James grasp the value proposition in your receptionist resume fast. Go for a chronological resume format. It puts your recent jobs first. That saves James’ time. Use big section headings, go heavy on white space, and pick presentable resume fonts. Pro Tip: Once done, save your receptionist resume in PDF. Word resumes can go south in transit. In our builder, you can change the template of your receptionist resume with a single click. Even after you’ve written all the contents. Pro Tip: It’s best to make a resume the style of which matches the culture of the company you’re applying to. 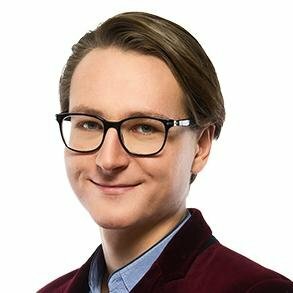 Eying a corporate receptionist position in a conservative organization? 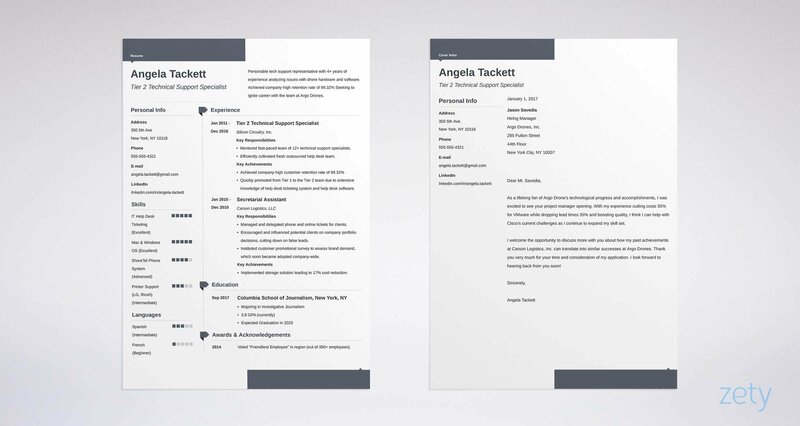 Go for an elegant, formal resume style. For jobs with relaxed companies, make a modern, creative resume. We know there’s no one-size-fits-all resume template for front desk jobs. That’s why in our builder you can create and customize a resume tailor-made to fit the employer’s expectations with your minimum effort. Your resume landed you a job as a receptionist at a Fortune 500 company! The hiring manager knew he wanted to hire you right after starting to read your resume. A the top of your receptionist resume, put a carefully-curated resume objective or a summary—a short and sweet paragraph that explains why you’re the perfect candidate. Which one to use on your resume? Receptionistresume summary gives an outline of your career and highlights your best achievements. It works like a trailer for the rest of your resume. Use it if you’ve got relevant receptionist job experience. Resume objective for receptionist jobs, in turn, discusses what you’ve learned so far and shows how you’d fit in. If you’re writing an entry-level receptionist resume with little experience, choose the resume objective. See how that works on these examples of summaries and objectives for receptionist positions. Receptionist with over 5 years' experience working in both the public and private sectors. Diplomatic, personable, and adept at managing sensitive situations. Highly organized, self-motivated, and proficient with computers. Looking to boost students’ satisfactions scores for ABC University. Bachelor's degree in communications. Former Penn State alum with a bachelor’s degree in communications. I’m looking to work as a receptionist. Now, see these two very different examples of entry-level resume objective statements for a receptionist position. Outgoing college grad hoping to work in the private sector. Looking to apply proven organizational and technical skills in a receptionist role. Eager to expand my skill set in an organization that will help me grow. Looking to work for a job at a university because I need job security and better benefits. Most receptionists’ job descriptions read pretty much the same. But it’s such a hard job! One that requires master-level multitasking and time management skills. Can you convey that on a resume? Yes. There’s a special way to describe your work history to make your receptionist resume stand out from the crowd like Ariana Grande in a Dunkin’ Donuts. Under each position, add up to 5 bullet points. In the receptionist job description for a resume, don’t just enter your duties. Focus on achievements. Quantify whenever possible. Numbers add meaning to the work you’ve done. If you just want to see sample descriptions of receptionist duties, look no further. Fielded communications from clients and colleagues, triaging requests. Acted as liaison between the company and priority clients. Managed training and travel schedules for employees. Implemented a new CRM with reporting capabilities. Cut costs by 30% and improved efficiency. Achievements backed up by metrics—that will make every hiring manager want to call in this candidate for an interview! I answered phones, organized mail, and scheduled training for the company. I was polite with customers in the waiting area. I took a lot of initiative. Could you be any more generic? You can format the text however you please: bold, italics, underlines, links to proofs of your proudest professional wins—with our easy-to-use text editor, sky's the limit! Come on, don’t be so modest. It’s your stellar skills set! Add, remove, and move around your receptionist resume sections using our builder. Create your resume now. Is listing your education on a receptionist resume the easiest part? Perhaps. Does it mean it’s least important? Hell no! You still need to include your education and describe it right. Employers might not care about your academic details, but they will want to know you have a degree. Move your education section above your work experience. Elaborate on what you’ve learned and achieved at school a bit more. Best receptionist resumes don’t just show your skills and experience. They prove them. By using additional resume sections. They showcase your verifiable achievements. Yes, if you have little experience, it’s a great idea to include a list of hobbies and interests in your office receptionist resume. After all, as a receptionist, you're the face of a company. You need to be friendly and personable. You also need to match the company culture. Showing that you're a fun and interesting person will not only make your resume more memorable. It'll also tell the recruiter you're a good fit for the company. How About a Receptionist Cover Letter? Contrary to what you might have heard, cover letters are still a thing. Half of recruiters won’t even bother to open your resume if there’s no cover letter attached. Plus, you can use a well-written receptionist cover letter to your tremendous advantage. Think about looking for a job with no experience? Daunting, isn’t it? Unlike a resume, a cover letter can explain your passion for the industry. A sense of purpose in pursuing your career. Finally, it can tell a story. And humans love stories much more than data sheets. But not only entry-level candidates should write cover letters. It doesn’t matter if you’re writing a spa receptionist resume, a medical office receptionist resume, a dental receptionist resume, or any other kind of a resume. Open your receptionist resume with a resume objective or a resume summary. Highlight your proudest wins and make an offer. In the job descriptions, focus on your achievements, not just clerical duties. Add numbers to validate your results. Match your office skills list with the skills required by the employer. Got more questions? Need further assistance? Drop me a line in the comments, I’ll get back to you straight away!